Life happens, but sound transfer doesn’t have to. Whether the noise is coming from a compressor enclosure, a noisy air duct, a drainage pipe, or granddad’s TV blaring a notch too high, easy-install soundproof barriers can help restore peace and quiet to your space. If you’re looking for a soundproofing material to prevent common noise like conversation, television or stereo sound from entering and leaving spaces, vinyl sound barriers are one of our most popular entry-level options. Our fiberglass temporary sound barriers are also a great option if it is only a short-term noise that needs to be quieted, or if you’re looking for a truly installation-free solution. Fiberglass composites are sound proof barriers that can go anywhere you would normally put fiberglass insulation. They are thin and come in four-square-foot and eight-square-foot sizes, so they’re perfect for applications like quieting HVAC air ducts or wrapping noisy pipes. Get your fiberglass soundproofing composite today! 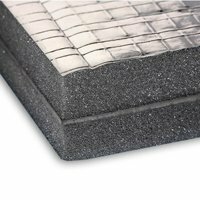 Foam composites are some of the most popular members of the Soundproof Cow soundproof barrier lineup, since they’re versatile and bring tremendous sound control. They consist of a combination of sound-absorbing polyurethane foam and our classic sound-deadening Quiet Barrier™ soundproof material. 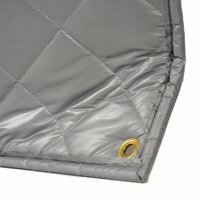 The combination allows the barrier to block sound while the foam helps isolate and enhance the barrier to protect against both airborne sound and vibration noise. These composites are easy to install, too — especially with PSA peel-and-stick application — and are an eco-friendly alternative to many other types of soundproofing insulation, as they consist of 80 percent recycled cotton. Order your foam composite soundproofing barriers now! 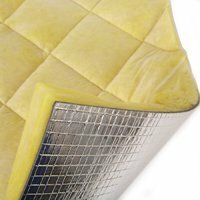 Temporary barriers are acoustical fiberglass quilts with or without barrier material that you can lay or hang almost anywhere for a flexible and portable soundproofing solution. These quilts can absorb sound, creating a more pleasant interior environment and, with the barrier, block sound transfer as well. You can order yours in 2’ x 4’, 4’ x 4’ or 4’ x 8’ sizes online right now. 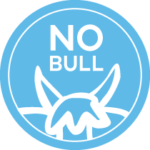 If you’re looking for tough, industrial-strength noise reduction, look into our MLV barriers. MLV, or Mass Loaded Vinyl, is about as effective as lead soundproofing without the unwanted environmental ramifications. These vinyl sheets give tremendous mass to the enclosed area where you install them, creating a dense barrier that blocks sound. These are the soundproof barriers the pros use. 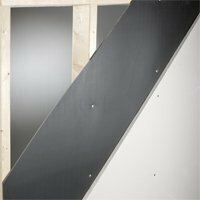 Use vinyl soundproof barriers in between layers of drywall for serious soundproofing power in homes, offices and industrial buildings. Try this amazing soundproofing material today!